The Italian political scientist Gaetano Mosca in The Ruling Class (1896) noted that political leaders in all countries propagate myths or “political formulas” that resonate with citizens and thereby exist to the benefit of the ruling elite. Such myths are usually based on a nation’s history, culture, and folklore, and are frequently based on half-truths, sentiment, and emotion. They are propagated in art, music, official monuments, history books, fictional narratives, and film. In Russia: The Story of War, Gregory Carleton, a professor of Russian Studies at Tufts University, provides a fascinating cultural history of the evolution of what he calls Russia’s “civic religion,” a “grand narrative of war” that reaches back to the Mongol experience in the 13th through 15th centuries and the Time of Troubles in the early 17th century. The key ingredients of the Russian war myth are invasion, resistance, self-reliance, and self-sacrifice. It is a narrative that appears repeatedly throughout Russian history, literature, art, and film, and is a current staple of Russian President Vladimir Putin’s political rhetoric. Carleton writes that the “twin pillars” of the war myth are Russia’s victories over Napoleon and Hitler. The resistance and sacrifice of Russia’s soldiers in those wars are epitomized respectively in the Battles of Borodino (1812) and Brest (1941). At Borodino on the third day of the battle, Russia suffered more than 50,000 casualties in an unsuccessful effort to stop Napoleon’s Grand Armee before it reached Moscow. French casualties are estimated at 35,000. It was the single bloodiest day of the Napoleonic Wars. Carleton notes that “[s]oldiers’ limbs and heads were torn off, their bodies disemboweled, their chests run through with bayonets,” all within a space of two square miles. Twenty-nine Russian generals died at Borodino. The carnage, explains Carelton, made it “one of Russia’s proudest battles.” It is almost, he writes, “as if Borodino were the nation’s Golgotha.” Borodino was forever seared into Russia’s soul in Tolstoy’s War and Peace as an example of the courage, resilience, and defiance (stoikost) of Russia’s soldiers. More than a century after Borodino, Russian soldiers again resisted Europe’s would-be conqueror, initially at the Brest Fortress. Located at the crossroads of Central and Eastern Europe, the Brest Fortress was attacked by Hitler’s troops in June 1941. Weakened by hunger and thirst, the garrison at Brest refused to surrender. “Outgunned, out-teched, and outnumbered,” Carleton writes, “Red Army soldiers fought like superhumans,” and their heroics were memorialized by historian Sergei Smirnov in Brest Fortress (1965), a book that remains in print in today’s Russia. Since then, Brest has been the subject of movies and documentaries, and the fortress’ actual walls have been preserved “as a unique totem of the war, garrisoned by two huge, Soviet-era monuments.” It was one of the early battles in a war that cost Soviet Russia more than 27 million people. The Russian war myth also serves to lessen the impact within Russia of historical revisionists who point to the less favorable aspects of Russia at war: its long and continuous history of geopolitical expansionism, its role as Hitler’s accomplice in starting the Second World War, its establishment of a Stalinist tyranny every bit as evil as the Nazis, its more recent aggression in Georgia and Ukraine. Another aspect of the war myth that complements what historian Richard Pipes has called Russia’s patrimonialism is the imperative to avoid anarchy and civil war—what the Russians call smuta. 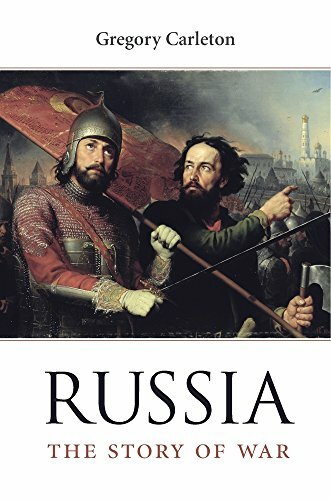 Carleton explains that this is the lesson of the Time of Troubles of the early 17th century, the Russian Civil War of 1918–1921, and the fall of the Soviet Empire in 1989–1991. The antidote to anarchy and civil war for Russia is strong centralized state power, which produces domestic tranquility and wards off foreign intervention. It is this aspect of the war myth that Vladimir Putin finds so useful and that makes him so popular in today’s Russia. Putin’s appeal to Russia’s war myth, Carleton notes, touches feelings and emotions that “lie deep in the soil of Russian history.” Indeed, Carleton traces them to Alexander Nevsky, who defeated the Swedes at the Neva River and the Teutonic Knights at Lake Peipus in the mid-13th century, resisted the efforts of the Pope to convert Russia to Catholicism, and strengthened the Russian state by promoting a sense of national identity. Western leaders would be wise to take note.